Bushwalk Australia • View topic - PLB Battery Replacement. Is it worth it? The battery in my PLB is coming up to its expiry date. I certainly wasn't an early adopter of this type of tech so I'm guessing that others here have already dealt with this issue one way or the other. My PLB is a McMurdo Fastfind 211 with GPS. It's a discontinued model which has been superseded by the McMurdo Fastfind 220. Since I've just renewed the registration with AMSA, I noticed that the battery expires in August next year. The million dollar question is - to get the battery replaced on an obsolescent PLB or upgrade to the latest and greatest? I understand from the AMSA website that McMurdo's service agent in Australia is www.amisales.com.au. I have sent them an enquiry asking for a quote to get the battery replaced, but I'd like to know if any members of the forum have had dealings with them. Re: PLB Battery Replacement. Is it worth it? Maybe base it on cost and how long the battery life (in years) is after the replacement. The GME MT410G units have a 7 year battery life but are heavier. The RESQLINK looks good too for about the same price and have a 6 year from manufacture battery life. The Fastfind seems much more expensive to buy. Thanks Neil, the McMurdo 211 has a 5 year battery life (from date of manufacture). If I was to replace the battery I daresay that by 2021 there will have been changes to either the frequency or the technology itself, so I'd prefer to avoid upgrading my PLB until that time. If forced by cost to pick up a whole new unit, I'd probably grab a RESQLINK since they are small and light enough to integrate with my gear. I'll report back how it goes. Last edited by Bushman_Craig on Wed 14 Sep, 2016 10:41 am, edited 1 time in total. McMurdo Fastfind 220 - once GST is factored in the cheapest seems to be around the A$400 mark. ACR ResQLink+ 406 MHz GPS PLB - retails at around A$299 - This would probably be the one I'd upgrade to. Oops same one as Strider was linking and a better price on your link Strider. I think I'll look into these units further. Cheers. I think you will find the battery replacement will cost as much as a replacement unit. dunamis wrote: I think you will find the battery replacement will cost as much as a replacement unit. Keep in mind that PLBs also have a lot of electronics inside. Getting a replacement battery doesn’t necessarily refurbish the electronics. The manufacturer/repairer will fully test the unit as part of a battery replacement - which is part of the reason that they tend to be not much cheaper than a new unit. However, some of the electronics will still be 5/6/7 years old and I would say likely be more prone to failure. Not sure about the McMurdo, but on my ACR Resqlink, the battery pack is made up of 3 x CR123A 3V Lithium primary batteries to give a total of 9V. Good quality Lithium primary CR123As will cost around $10 each, and say add a bit for the nickel joining tabs, the connecting cable, and a seller's markup, I reckon these should cost in the order of $50-80. So charging around about $150 for the battery replacement is a bit rich. Yes, I understand that it will be fully checked to test it still works, but a lightly used PLB which has an expired battery should not just end up as landfill just because they are trying to gouge on battery replacement prices. AMSA says that it is mandatory for beacons, in situations that need to be carried by law, to be properly serviced to the manufacturer or approved service centre. http://beacons.amsa.gov.au/maintenance/servicing.asp This applies to generally to marine use, and doesn't impact bushwalking though. I haven't looked into whether anyone actually makes these 9V lithium battery packs for other devices since my PLB has a few years to go yet. But the cable doesn't look proprietary - it appear to be a standard power plug cable, so it is possible that these battery packs may be manufactured for other devices. Theoretically, if you had the equipment to spot weld the nickel tabs to each CR123A you could make your own battery pack. Soldering tabs to batteries isn't recommended. You could inspect or replace the case o-rings/seals when opening, and run the tests on it after the new battery is inserted. Maybe in a few years when I've upgraded my PLB and the current one runs out I might try sourcing a replacement battery. I can see myself pulling it apart when the battery expiry date passes, to test the battery pack with a multimeter to see how much voltage was left after the expiry date. It wouldn't surprise if the manufacturers err on the side of caution to suggest early replacement. Nice dissection Keith! I'm almost sure that kind of battery units are available online from somewhere. Worth digging around. There used to be a battery wholesaler in Hobart that had a little machine that welded tabs onto batteries. You will find that normal soldering doesn't work very well. For a device that when used will almost certainly be the difference between life and death, the price of a new unit and all the guarantees that come with it is not hard to justify. Bushman_Craig wrote: The battery in my PLB is coming up to its expiry date. Isn't the use of a PLB against your 'traditional' walking ethic? Smoke signals would be more appropriate. Or maybe just accepting that one day, you're going to kark it and if that happens out bush, so be it. Cost isn't even a thought if you are honest and serious about the use of a PLB. I'm not suggesting that it isn't a good idea to have a working PLB or circumventing the legislation that mandated PLBs need to be serviced by authorised dealers. Just noting that the pricing for a replacement battery seems to me a bit like price gouging. I can see why they are doing it though. The PLB manufacturers would like to keep themselves in business - since someone buying a PLB might not be a returning customer for 5-10 years. Buying good quality Panasonic CR123a batteries in a 20 pack for instance can cost as low as $4.50 each, so 3xCR123A in a battery pack could be under $15 for the batteries alone! https://www.batteriesdirect.com.au/shop ... 3361/.html. I'm sure someone buying them in larger quantities can get them cheaper. If you have the equipment to test the battery pack's voltage though, I think it is doable. I'm not sure if all PLBs give a low battery warning at all. With a battery pack that I can physically inspect, I can check the voltage and be certain that the PLB has the battery capacity to function in emergencies before heading out. Of course, I'd be using a resistance load to test the battery pack under load, rather than the resting battery voltage. Mark F wrote: There used to be a battery wholesaler in Hobart that had a little machine that welded tabs onto batteries. You will find that normal soldering doesn't work very well. 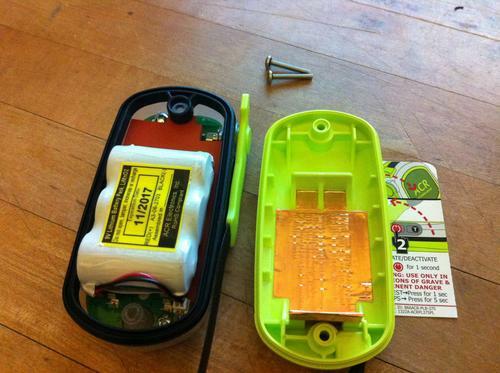 That is true - soldering the tabs to batteries is not recommended. The best way to do it is with that spot welding machine. I had it done when making a 4xAAA NiMH pack it was far superior than my first soldered battery pack attempt. Again, if you are not comfortable with this, by all means get a new PLB. My point is that the replacement battery packs are relatively cheap using the same or superior LiMnO2 batteries, so paying the $150 or $200 or more for a battery replacement and test seems excessive. Mind you, I haven't checked with ACR service as to the cost of replacing the battery and testing the Resqlink - I think the $150 was from US forums when I was researching which PLB suited me. 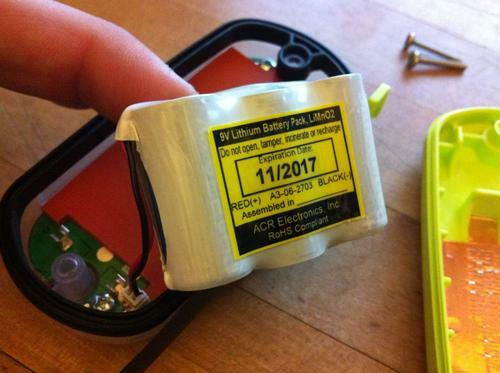 Oh, for Bushman_Craig - I was trying to find the link from the US forums regarding the PLB battery replacement cost, and I saw quite a few dated posts from Australian kayaker forums saying that the McMurdo distributor also never responded to their queries on battery replacements either. Be interesting to hear if you ever get a response from them. But if it is >$250, I'd suggest a new PLB as well. When I was researching PLBs for myself, I recall reading some GME models weren't as waterproof as they claimed - I can't remember which model it was though, might be an old superseded model now. Traditional walking is a pastime, not my bushwalking ethic. Is that OK with you, or should I pen a detailed justification for how I choose to experience the natural world? keithy wrote: I'm not suggesting that it isn't a good idea to have a working PLB or circumventing the legislation that mandated PLBs need to be serviced by authorised dealers. One thing we can be sure of in current global economic paradigm is that if people can gouge, then they will. Sad really. The SA2G is the frontrunner for a replacement unit at the moment. A ten year battery life is a blessing I guess. Thanks for all the responses guys and gals, you've been a great help. When I bought my PLB1 I checked the battery replacement cost first. I was quoted in the order of $180. Given the unit new costs $350, getting the battery replaced is a no brainer - plus it's better for the environment than just dumping the old one. More than 50% of the airborne beacon searches I've been involved in have been expired PLBs that people have dumped in their trash, and they've been accidentally activated at the local tip. I very much doubt the electrical circuits will degrade after 5-7 years. Modern soldering and no doubt good quality components like capacitors which go into one of these won't be cheap rubbish. With my electrical background, I'd happily get my battery replaced in the PLB1 twice (by an authorised service centre) ... which is 21 years of service. No, just acquire a sense of humour next time you're passing the appropriate shop. Unless you're allergic . . . ? north-north-west wrote: No, just acquire a sense of humour next time you're passing the appropriate shop. Unless you're allergic . . . ? I have a Kannad Safelink solo which is due for a new battery in a few months. This PLB model is still available and it seems to meet my needs quite well- i dont need any upgrade etc. The Australian agents for Kannad advised me today, that the solution to battery replacement is to buy a complete new unit at a discounted rate from them. I've never considered the PLB unit as disposable- in fact I haven't even used it yet! I've just reread my users manual re my plb's onboard self test procedure. This test apparently checks the battery condition and reports accordingly. 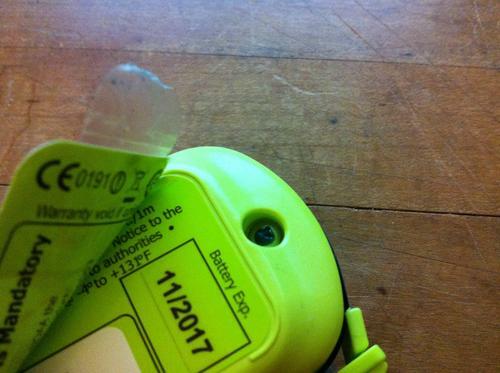 So, a question for you all, can I use the PLB beyond the recommended battery replacement date ( which, in my case, is the device throw away date) by just perfoming the self test before each excursion? Does AMSA have any stipulation on the PLB's validity life for registration purpose? Ring them and ask GPS. I have in the past and they were very helpful. The big and very pleasant surprise was that the person who answered the phone had the answers! Bill P wrote: The Australian agents for Kannad advised me today, that the solution to battery replacement is to buy a complete new unit at a discounted rate from them. The solution to battery replacement (with some brands) is to get yourself into a situation when you need to activate the PLB. Many manufacturers and distributors will replace the unit free of charge after a valid activation. I must stress the 'valid'. They will ask for a report from you as to how and why the unit was activated, and check with the relevant SAR group that it was warranted. NNW - a bit hard on the average tax payer, several thousands of public money to save a couple of hundred dollars of personal expenditure. Are you planning a career in politics? Better than spending millions on a non-binding plebiscite. You know, I ought to report you for such a disgusting insult. Politics, indeed!